PatientKeeper is certified for 2011 Edition as a Modular EHR, including CPOE and Medication Reconciliation, and we will be seeking 2014 Edition certification by the end of this year. From Wannabe Recovering Consultant: “Re: anonymous CIO interview. Incredibly fascinating. I would love it if you could do more of them. His or her insights into the thinking of a CFO made me think that an anonymous CFO interview would be equally insightful as relates to IT expenditures and activities.” That would be fun, too, if anyone wants to volunteer. I spent most of the week in San Diego at the annual MGMA conference and posted several updates on HIStalk Practice. Take a read to get my impressions on some of the sessions, what was cool and not so cool in the exhibit hall, the scoop on after-hours parties, and what folks were talking about. If you prefer a more visual experience, you’ll find lots of pictures, including one or two of hot shoes. I also encourage you to check out Dr. Gregg’s latest post, which offers a few comebacks to the EHR nay-sayers. Thanks for reading. Welcome to new HIStalk Platinum Sponsor Medi-Span, part of Wolters Kluwer Health. Medi-Span offers customized drug databases and medication decision support modules that enhance patient safety, support interoperability, and decrease alert fatigue. Medi-Span makes EHRs and other clinical systems smarter, supporting functions that include prescribing, dispensing, and claims processing for 1,600 hospitals, 49,000 retail pharmacies, and all 10 of the top pharmacy benefits managers. In addition to drug information, decision support, and pricing tools, MediSpan’s new offerings include Controlled Substances File that covers both federal and state requirements; Alert Control customization capability, Patient Safety Programs File that identifies drugs that have Black Box Warnings, Medication Guides, tallman names, or REMS; and ICD-10 Mapping Files. Thanks to Medi-Span and Wolters Kluwer Health for supporting HIStalk. Health Catalyst will offer “Surviving Value-Based Purchasing: A Road Map to Success Under the New Reimbursement Model” on Tuesday, October 15 from 1:00 – 2:00 p.m. Eastern. Presenters will be Bobbi Brown, VP of financial engagement for Health Catalyst, and Jane Felmlee, healthcare consultant. 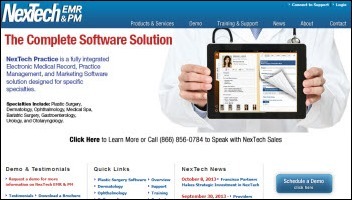 Francisco Partners makes a strategic investment in EMR/PM vendor NexTech. Three top executives of Bottomline Technologies take a pay cut from the previous fiscal year following the company’s 2012 net loss of $14.4 million. The combined compensation packages fell from $5 million to $4 million. API Healthcare announces Q3 accomplishments that include a 23 percent increase in bookings and 35 new healthcare customers. 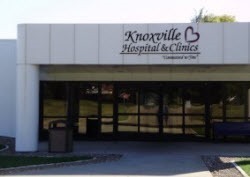 Augusta Health (VA) will implement community HIE technology from Sandlot Solutions. Sentara Healthcare selects HealthMEDX to automate its clinical and financial operations for its skilling nursing, transitional care, and assisted living facilities. San Luis Valley Health (CO) adds the iDoc document management software from CareTech Solutions. Northern Colorado Anesthesia Professionals, LLC (CO) chooses Shareable Ink’s Anesthesia Cloud for data capture, billing, and scheduling and will use the company’s ShareMU program to help its providers earn EHR incentive payments. UNC Health Care (NC) extends its relationship with Practical Data Solutions, Inc. to deploy data models for Epic Resolute and Cadence, adding to its previous work with UNC on GE Centricity and Allscripts Enterprise. Alere ACS hires Helen Figge (HIMSS) as VP of clinical integration. St. Joseph’s Healthcare System (NJ) names Jane Tsui-Wu (Stony Brook University Hospital) as VP/CIO. Streamline Health Solutions names Jack W. Kennedy, Jr. (PRGX Global, Inc.) as SVP/chief legal counsel. Ian Gordon (Topaz Shared Services) joins McKesson Health Solutions as SVP/GM for decision management. Liaison Technologies announces three new board members: William E. Kitgaard (Covance Global IT), David Parker (WebLogics), and Joseph B. Volpe III (Merck Global Health Innovation Group). 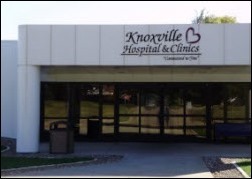 Knoxville Hospital and Clinics (IA) goes live on its $2.8 million Cerner implementation. 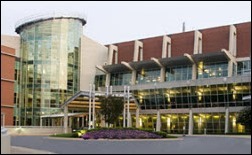 Bon Secours Health System (MD) integrates Wolters Kluwer Health’s UpToDate clinical decision resource within Epic. 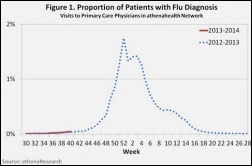 Athenahealth will monitor and share population health information on flu outbreaks and other communicable diseases from its national database to fill the current gap in CDC reporting. Because of the government shutdown, the CDC has furloughed 8,754 employees (70 percent). Makes you wonder how much money the government could save if the private sector took over a few more tasks. iMDsoft makes the MetaVision AIMS, MV-OR available via cloud-based hosting, with licenses offered on a subscription basis. 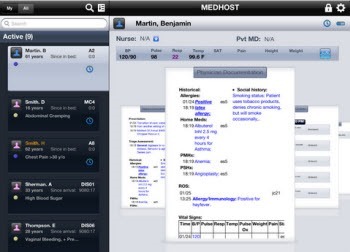 MEDHOST introduces AXON, a native iPad app that enables clinicians to interact with the MEDHOST EDIS. Infor launches Health 3.0, the company’s vision for the future of HIT, which includes a suite of products that address the shift to value-based reimbursements. The VA Office of Information and Technology furloughs 2,754 employees, halting all software development on the VA’s benefits management system. NIH awards Sutter Health, IBM Research, and Geisinger Health System a $2 million research grant to develop analytics methods to detect heart failure using EHR data. Virtual assistant developer Next IT announces GA of Alme for Healthcare, which will respond to customer service questions and increase patient engagement. Epocrates introduces Provider Directory to help members easily identify other clinicians for consultations and patient referrals. A RAND study finds that the primary driver of job satisfaction for physicians is being able to provide high-quality healthcare. EHR use impacts doctor job satisfaction because of worries that EHR use interferes with face-to-face patient interaction increases clerical work by doctors. Physicians also have concerns that medical record accuracy may be negatively impact when templates are used. American Well expands its $49 a visit telehealth consult services to 44 states and DC. The Orlando business newspaper lists the salaries of executives of Adventist Health System. CIO Brent Snyder made the list with $1.14 million in salary in 2011. Kansas City’s City Council Planning, Zoning & Economic Development Committee unanimously approves a plan to give Cerner $1.63 billion in tax incentives for its $4.3 billion expansion project. The full council is expected to extend approval Thursday for the 11-building, 4 million square foot development that would be built in 14 phases over the next 10 years. A quality incentive program for salaried physicians at Massachusetts General Hospital improved EHR adoption and hand hygiene compliance, reduced ED use, and increased efficiency in radiology and cancer centers, according to a study published in Health Affairs. Physicians could earn incentives of up to two percent of their annual income, leading researchers to conclude that even small incentives can impact behaviors that improve the quality of care. eClinicalWorks hosts its national users conference October 11-14 in San Antonio. Gartner positions Informatica as a leader in its 2013 Magic Quadrant for Data Quality Tools report. Visage Imaging is exhibiting at this week’s ACR Annual Informatics Summit in Washington, DC, with GM Brad Levin participating in an October 11 vendor panel on mobile imaging solutions. Aprima Medical offers customers an option to use TSPi’s MicroCloud Platform as a Service solution to host their Aprima EHR. Billian’s HealthDATA and the Alliance for Home Health Quality & Innovation co-host an October 22 Twitter chat on mobile health and in-home technologies. CCHIT extends ONC 2014 Edition Modular EHR Certification to PatientTouch System 3.2.2 and PatientTouch System 3.3 from PatientSafe Solutions. 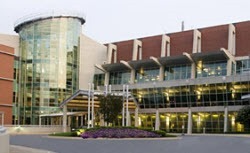 Cerner will add Wolters Kluwer Health’s Provation Clinic Note content and decision support into Cerner Millennium. TriZetto releases details of its 2013 Executive Vision Summit November 12-14 in Scottsdale. The American Hospital Association extends its exclusive endorsement of data center hosting services from CareTech Solutions. pMD explains how its mobile charge capture solution can improve the PQRS reporting process. Technology from Awarepoint and Versus are featured in a 24X7 article on the growing use of RTLS in healthcare. 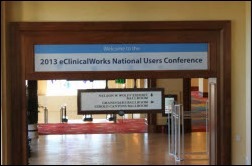 EClinicalWorks adds Elsevier’s ExitCare technology for evidence-based patient education and discharge instructions into its EHR. Quality Systems’ subsidiary Mirth releases Mirth Connect 3.0, an open source healthcare integration engine for HL7 message integration. 3M Health Information Systems introduces the 3M Outpatient CDI Program, which offers consulting services for outpatient facilities and physician practices needing to improve the documentation and coding process. I’m completely disheartened by the behavior of our elected officials during this government shutdown and the months leading up to it. Regardless of your side of the aisle, it seems everyone is behaving badly at this point. One of the things that surprised me is the shutting down of government websites. I was looking for information on a potential vacation site and discovered the National Park Service websites are down. I understand not paying people to create new content or update pages, but am not following the logic on how taking down the websites is saving a significant amount of money. If they’re using commercial hosting at all, I doubt their vendors decided to quit charging them due to lack of appropriations. If they’re self-hosted, did they just turn out the lights at the data center and leave a few random servers up to share the message of gloom and doom? Are they hoping to cut their cooling bill as a way to balance the budget? I understand it’s all a political maneuver to make it as uncomfortable for everyone as possible, but it seems a little over the top. I decided to do some informal surfing to determine which websites were “essential” or not. The National Park Service sites are down. Everything redirects to the Department of the Interior home page, which is up. Also live is the Deepwater Horizon oil spill page for those urgent updates from the 2010 spill. Not sure why that’s essential. The web pages of the USDA Forest Service are live with a disclaimer that they will remain available for public safety announcements and updates for wildfires, floods, and other natural disasters, which seems reasonable. The Centers for Medical & Medicaid Services sites are up, with a disclaimer that information may not be up to date. That approach at least makes more sense than what the National Park Service has done. Is depriving fifth graders the ability to read about Old Faithful really the best way to serve the next generation of leaders? I think not. One page that I found live with absolutely no disclaimer or mention of the shutdown is the HealthIT.gov page on How to Implement EHRs. Even the HHS HealthITBuzz blog is up without a disclaimer, although the last update was September 26. I wish the majority of physicians I worked with shared the same urgency for EHR adoption as the website does. Also, I was happy to see most of the Veteran’s Affairs websites still up (although there may not be people processing anything on the other side of the wires, which is shameful). Those of us that work in healthcare IT are constantly preparing and refining our business continuity plans. We make sure we know how to deal with a business disruption and how to actually resume our processes when the systems come up. I wonder how many federal IT departments have the same level of thought or planning? I doubt they perform regular “government shutdown” drills and they probably don’t even have a downtime box because there would be no one there to use its contents. We can only assume that when the systems come back on line things will be messy. Hopefully the parties involved will figure out a way to come together and start serving the American people again but, I think that’s probably asking a lot at this point. In the meantime the rest of us will continue doing our jobs, caring for patients, keeping the systems running, and paying our bills. And at least one of us will be dreaming of the Dry Tortugas. Got a seaplane? Want to sneak into a National Park? Email me. If you are wondering why all those gvt sites are down, here’s probbaly why. A well designed and built web site can run unattended for months or years. 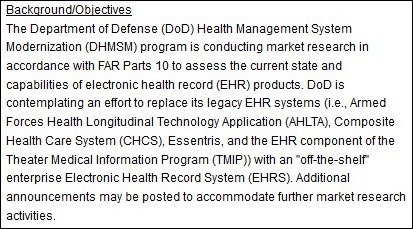 But clearly based on the feds recent experience with the new Health Insur sites they do not know how to build one. So there are probably hundreds of non-essential federal workers plugging holes every day keeping all those other sites up. Congress sent them all home and the sites went dark the next day. That’ why! And…all the NIST time sites are down so if you want to get your software certified…bring your own clock! Dr. Jayne – how nice to see a picture of my favorite national park, Fort Jefferson. Located in the Dry Tortugas area off of Key West, this fascinating National Park will immerse you in the adventure of the old days when it was a real fort that protected the United States during the Spanish American War, the Civil War and the World Wars. Imagine, a fort that looks sort of like the Pentagon sitting out there on an is,and in the midst of beautiful deep blue, turquoise and white water. Truly one if our nation’s treasures. And it’s a great stop for scuba divers who are on the M/V Spree. Dr. Jayne ~ It’s called shock & awe. Shut it all down (even that that is uneccesary) to get everyones attention. More importantly to make the GOP look like they are the cause of all the mass confusion. I’m with Mr. Whitekeys, this is a gem. I went there several years ago to stalk the otherwise pelagic sooty tern. Who knew this place existed? Probably not Ted Cruz. Wow, excited to see so many comments on EPtalk and especially to hear my interest in the park is well-placed. Looking forward to some camping there once the shutdown is over. Or maybe sooner if someone with a seaplane and pirate tendencies turns up!